The Wolf Moon, the Snow Moon, the Worm Moon, the Pink Moon, the Flower Moon, the Strawberry Moon, the Buck Moon, the Sturgeon Moon, the Harvest Moon, the Hunter's Moon, the Beaver Moon, and the Cold Moon. 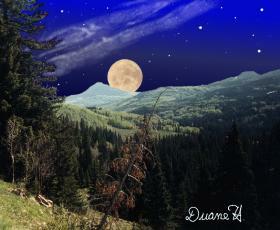 Right: "Harvest Moon Rising" by artist Duane Hilton. They're really all the same Moon, of course, but long before the advent of modern calendars people named the full Moons of a year to keep track of time. These fanciful names have been handed down through the generations and they are still a part of modern Moon lore. Tonight and tomorrow you can see the Harvest Moon. The Harvest Moon is no ordinary full moon; it behaves in a special way. Throughout the year the Moon rises, on average, about 50 minutes later each day. But near the autumnal equinox, which comes this year on Sept. 22nd, the day-to-day difference in the local time of moonrise is only 30 minutes. The Moon will rise around sunset tonight--and not long after sunset for the next few evenings. That comes in handy for northern farmers who are working long days to harvest their crops before autumn. The extra dose of lighting afforded by the full Moon closest to the equinox is what gives the Harvest Moon its name. In the southern hemisphere, this week's full Moon behaves in exactly the opposite way: there will be an extra long time between moonrises from one evening to the next. Try looking at the Moon tonight when it's rising in the east. You might notice something funny: the low-hanging Moon looks very big. This is a trick of the eye known as the "Moon Illusion." Presently, Earth is the only planet in our solar system where farmers rely on the light of a moon to help them complete their chores. But one day that could change. Centuries from now, humans might well till the fields of a terraformed planet Mars. Will martian farmers enjoy a brilliant "Harvest Moon" like their counterparts on Earth? Mars has two diminutive asteroid-like satellites: Phobos and Deimos. The larger, Phobos, is only 22 km across, while Deimos is barely 13 km in diameter. Compared to Phobos and Deimos, Earth's 3500 km-wide moon is a giant. A "Full Phobos" shines down on Mars with a visual magnitude of approximately -10. That's about as intense as a quarter-Moon on our planet -- not bright enough to read a newspaper, but sufficient to cast shadows. Deimos, because it is the smaller and more distant of the two, reaches a visual magnitude of only -6 at its full phase. That's still intense, but more like a very bright star than a shadow-casting Moon. So, the satellite that future martian farmers are most likely to nickname the "Harvest Moon" is Phobos. If future farming on Mars is anything like farming on Earth, the Harvest Moon will occur in late martian Summer. But unlike the Harvest Moon of Earth, Phobos will provide many Harvest Moons for the farmer of Mars. Phobos is in such a low orbit that it races around the Red Planet three times each martian day (Mars rotates on its axis once every 24.6 Earth-hours). As seen from the surface of Mars, Phobos would rise in the west, move rapidly across the sky, and set in the east with a synodic period of 7 hours and 39 minutes. Farmers near Mars' equator could observe as many as two fleeting Phobos full moons during each 12.3 hour martian night. During the day, martian colonists might consult a timetable of the coming night's "Full Phoboses" to decide the best intervals for outdoor work. Farmers on Earth are more fortunate that our planet's moon moves at a relatively leisurely pace, completing one orbit in 29.5 days. Harvest Moons on Earth cast their bright light all night long, and careful timing is not required to see one. Harvest Moon -- from EarthSky.org. Block & Byrd give a lucid explanation of what's special about the Harvest Moon.